It is just so goddamned refreshing to see a period film made with such affection, such glorious reverence. Khoya Khoya Chand does its best to transport you to the golden era of Bollywood, among archaic lights, melodramatic sets, divas and classic automobiles. The visual treatment is stunning, and thanks to that and a superbly chosen cast, we get to smell the vintage greasepaint. And while I profess, increasingly as I think about the film, indulgent affection towards it, I must admit to being clueless as to how the audience unconnected professionally with cinema will perceive it. Perhaps the in-jokes, at almost every step of the film, will be lost on them. 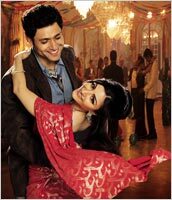 This is an unhesitatingly insider film, Bollywood reflecting on Bollywood, not marked by raw impressions or cynicism. Then again, the audiences might also, in their potentially awestruck viewings of old-school filmmaking in a lovely film, gloss over the movie's flaws. I'm curious. This isn't Sudhir Mishra's 8 1/2 or his Day For Night, this is his Aviator. It is a glossy, neatly crafted romance set against an era of cinema the director himself is clearly overwhelmed by. The tale is of a pretty young starlet -- who has been more couched than cast, right from an abominably early age -- and her compromise to break into the limelight by giving in to the reigning star. Enter, then, the nascent screenwriter who tells it like it is, and who she ends up falling for. It is a fine tale of compulsions and choices, of free will and helplessness, of Filmfare Awards and fat financiers. This is one of the filmmaker's most simplistic films, however, where the characters are clearly-delineated but utterly lack subtext. It is a neat love story, conflicted yet obvious, dramatic and basic -- not that there's anything wrong with that. The basic problem lies in the telling. While not claiming intimate knowledge with the world of the times, I doubt any of us have ever encountered taxiwallahs who spoke like Guru Dutt in Mr & Mrs 55. The films of the 50s are -- as of any era -- not a depiction of the life and times, but a thematic indicator of the ideas, the romance and the box office of the age. There is a classic scene in Aviator where Katharine Hepburn takes Howard Hughes to lunch with her family, and while there is much wit and repartee, the conversation is still casual enough to be markedly different from the times they are on the set. Khoya, however, is peopled by the stagy set, by men who raise sinister eyebrows and women who delight in the soliloquy. Even though their conflicts and concerns may be real, they behave filmi. Soha Ali Khan has the meatiest role, an author-backed character that requires her to emote and over-emote, to go from merry to melancholy in a heartbeat, and she manages this rather strongly. Sure, she is given unreal lines, but there is a fiery-eyed conviction as she toils on them, visibly straining to stay in character. It is a solid performance, and -- called on to act for probably the first time in her yet-budding filmography -- she delivers. The film rests on her shoulders, yet she manages to look like a pin-up. More than that (but with much less to do) is Sonia Jehan, a ravishing beauty brilliantly cast as a diva, and in the film's finest scene outdoes herself when she asks, equal parts coy and manipulative, why she should sign a certain film. Classic. Rajat Kapoor [Images] is super as a star, first debauched then desperate, and Saurabh Shukla's chubby financier gets all the one-liners. Shiney Ahuja [Images] is occasionally all right with the intensity, but whenever he has to break the glare, when he has to grin and throw stones at a producer's house, the acting effort shows. It is a tastily put together film -- much credit to cinematographer Sachin K Krishn -- but is bogged down by a self-pitying protagonist. While I could still be persuaded to not wince through the shot of the director weeping and forgetting to say 'Cut!,' Ahuja's writer-director seems too pouty and kerchief-needy -- even as everything falls into his lap. Um, more or less. Darn the inconsistency. The film starts off unreal but is being narrated by Vinay Pathak as an assistant director, so you sit back and imagine these are romanticised flashbacks as told by a warmly nostalgic chum, and that imparts an air of Bollywoodity to the proceedings. Yet this character loses his omniscient voice, and we are now left on our own -- but the staginess continues. I'm fine with the film, outside of Shiney Ahuja and the third act. There is much to smile at and much to applaud fondly, and many a cameo. It is a lyrical film, and -- that title song is magnificent -- the music holds together perfectly. I just wish we didn't have the title cards at the end. Do go watch it. It is a sincere effort, a work born out of sheer love for the medium, and I earnestly wish we would see more films like this.